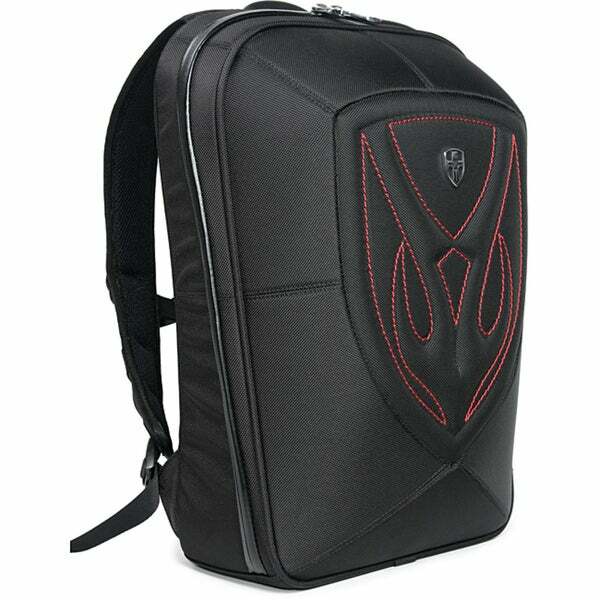 Tucano Tugo Medium Water Resistant Travel Notebook Backpack with Security Pockets for Laptops up to 15.6"
Carry your important paperwork and laptop in style with this flame-designed ballistic nylon laptop backpack. The multitude of pockets and padded laptop sleeve ensure that your documents stay safe and secure while on the go. Inspired by the classic imagery and imcomparable style of American V-twin motorbikes, ZEYNER is dedicated to creating unique accessories that are as stylish and durable as they are original. The 1682 Denier Nylon is the strongest nylon in the luggage industry, and the hardware is from California. ZEYNER takes its name from the German words, "Zeit" meaning time, "Ein" meaning world unity, and "Er" meaning human, which means that ZEYNER is dedicated to linking the traditions of handmade designs and art to the latest technologies and trends in order to create bold, functional products. Flame design backpack. Premium 1682 Denier Ballistic Nylon. Water resistant zipper keeping interior valuables dry. Aerodynamically shaped foam pads facilitate in ventilation of your back when carrying. Flat bottom structure designed to prevent falling over when placed without support. Adjustable strength-tested padded shoulder straps with moisture wicking mesh material. Ergonomically sewn strap pulls for easier pulling. D-ring on each strap for external accessory pouches. a great backpack, comfortable, holds a ton of stuff. great backpack alternative to a laptop bag; plus shows a bit of style. Very good looking and functional. Solid construction. This is my second Zeyner pack, and once again, I am very happy with my purchase. I love this backpack. Already used it on several trips. Very comfortable to wear and plenty of room. I love using it. Handle broke within six months of normal use. Would not recommend it because can't be replaced or refunded. The stitching is single thread. Black get Back Pack, brilliant&attainable.